Healthcare professionals trust Clorox Healthcare Bleach Germicidal Wipes to help them overcome infection control challenges in a constantly changing healthcare environment. Clorox Healthcare Bleach Germicidal clinical wipes are ready to use, 1 step cleaner containing a 1:10 bleach dilution to meet CDC and OSHA guidelines for disinfecting surfaces in healthcare settings. Designed for daily disinfection, high-touch surfaces and medical equipment. These wipes are EPA registered to kill a total of 58 microorganisms, including HAI causing bacteria like MRSA and VRE in 30 seconds, outbreak causing viruses such as Influenza A and B viruses, Measles virus and Norovirus in 1 minute and C. difficile spores, TB and fungi in 3 minutes. These wipes kill 99.9999% of C. difficile spores, according to the current EPA recommended testing standard (June 2014). 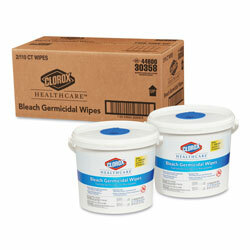 These wipes are engineered minimize residue and leave less visible residue on surfaces vs. competitor bleach wipes. They are formulated with an anticorrosion agent and are compatible with common healthcare surfaces including stainless steel, glass, plastic, porcelain, glazed ceramic, laminated surfaces and vinyl. Intended for use in healthcare settings. Towel/Wipe Type: Disinfecting Wipes; Application: Hospitals; Nursing Homes; Medical Facilities; Applicable Material: Acrylic; Ceramic; Chrome; Fiberglass; Glass; Metal; Plastic; Tile; Vinyl; Wood; Material(s): Non-Woven Fiber. Disinfecting Wipes, Cleaners and Sanitizers from Clorox! 5223 In Stock today.